The missile strikes on three chemical-weapons sites in Syria represent relatively small-scale action against Syrian President Bashar Assad and underline the extent of Russia's deterrent posture. The purpose of the strike was to damage Syria's chemical-weapons program and to deter the murderous regime in Damascus from unleashing further chemical weapons on the civilian population. Yet in actuality, the strikes are more of an indication of Russia's successful ability to cause Western powers to limit their action and opt for extreme caution in their response to Assad's crimes against humanity. Russian officials made explicit threats to shoot down U.S. missiles prior to the strike and even to target the missile-launchers. These threats are part of a wider Russian posture aimed at showing the entire world--and the Middle East, in particular--that Russia stands by the Assad regime, no matter what horror this regime unleashes. Russia's actions are guided by a cold hard logic. 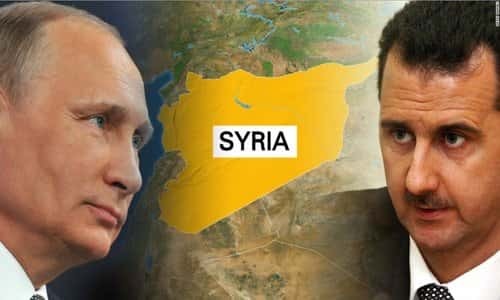 By standing firm alongside its Syrian client, it is broadcasting the message that any Middle Eastern actor who partners up with Russia will gain the backing of a major power that is practically unconditional. In between the lines, the Russian message seems to be saying, 'How can you trust the fickle West and the United States, who abandon allies, or leave them to fight alone? Join our sphere of influence, and you will receive real backing.' "
This kind of posturing is part of Moscow's attempt to rebuild its global empire and boost the value of its currency as a superpower ally. There will likely be regional actors who will pay attention to this message. As for the strikes themselves, they will probably have minimal, if any, impact on overall events in Syria. The reason that the Assad regime uses chemical weapons is because it is engaged in a war against Syria's Sunni Muslim population, and it is attempting to ethnically cleanse whole areas of communities deemed to be a "threat" by the regime. The Assad regime makes no distinction whatsoever between armed combatants and innocent civilians living in the areas from which the rebels operate, viewing them all as threats to its existence. This is why it repeatedly uses chemical weapons on entire neighborhoods, as well as conventional weapons, committing mass murder and trying to get the rest of the population to flee (preferably, from Assad's perspective) out of the country. Already, the Syrian refugee exodus is the worst since the World War II. Out of an original population of 22 million people, more than half have left their homes. Of those, half are internally displaced, and around half have left Syria's borders. The majority of these refugees are Sunnis. The Assad regime is made up of the minority Alawite sect, an offshoot of Shi'a Islam, and the fact that millions of Sunnis are fleeing the country suits it just fine. This strategic shift in the country's sectarian balance serves Assad's long-term goal of strengthening its rule, by terrorizing and butchering the Sunni population, and dwindling it by forcing it to leave Syria. As a result, Europe should expect further waves of Sunni Syrian refugees. The Assad regime not only has the backing of Moscow, but also of a regional and radical Shi'ite power: Iran. An array of Iranian-led Shi'ite armed forces are deployed across Syria, overseeing their brutal campaign against Syria's Sunnis. Striking three chemical-weapons targets in Syria will not change this. Meanwhile, Syria is also becoming an active combat arena between Iran and Israel. This is a front that is growing more explosive and tense with time. Iran is trying to convert its military assets in Syria into bases of attack against Israel. Jerusalem is showing resolute determination to stop this from happening. On Friday, the Israel Defense Forces announced that an Iranian drone, which flew into Israeli airspace in February and which was shot down by the Israeli Air Force, was armed with an explosive that was on its way to conduct an attack inside Israel. This represents the first known time that Iran has attempted a direct armed strike on Israel from Syria, rather than its traditional attempts of organizing attacks via proxy. The recent reported Israeli airstrike on an Iranian-run military base in central Syria, which purportedly was used by the Iranians to operate drones and threaten Israel, appears to represent Israeli self-defense. The goal is to stop Iran's plan of turning Syria into a forward base of aggression. In the aftermath of the strike, Iranian officials have been issuing threats to retaliate against the Jewish state. Israeli defense officials have reportedly responded by saying that if Iran makes good on its threat, the whole of the Assad regime could be destroyed in the Israeli response that would follow. These events represent a high-stakes struggle between Tehran and Jerusalem, with Iran pushing and testing Israel's red lines, and Israel enforcing them consistently. If Iran pushes too far and disregards Israel's warnings, this low-profile war will have the potential to turn into a major regional conflict.